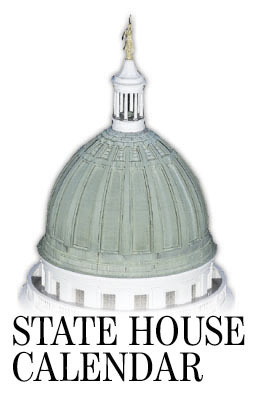 Legislative hearings and work sessions for April 12, 2013. L.D. 25, “An Act To Exclude Certain State-funded Costs from the State Share of the Total Cost of Funding Public Education”: beginning in fiscal year 2013-14 the state contributions to teacher retirement, retired teachers’ health insurance and retired teachers’ life insurance may not be included in the calculation of the state share percentage of the total cost of funding public education from kindergarten to grade 12. L.D. 569, “Resolve, To Study the Impact of Higher Maine Turnpike Tolls on Workers, Businesses and Economic Development”: emergency bill, establishes the Task Force To Study the Impact of Increased Tolls on Workers, Businesses and Economic Development. L.D. 588, “An Act To Abolish the Maine Turnpike Authority and Transfer Its Functions and Duties to the Department of Transportation”: abolishes the Maine Turnpike Authority and transfers its duties and the operation of the turnpike to the Department of Transportation. L.D. 621, “An Act To Change the Tolling on the Maine Turnpike”: directs the Maine Turnpike Authority to discontinue all toll facilities on the Maine Turnpike except for 6 toll collection facilities at the following locations: in the Town of York at mile 7.3; upon exit from the turnpike at the Interstate 295 interchange in the City of Portland at mile 44.3; upon exit from the turnpike at the Interstate 295 interchange in the Town of Falmouth at mile 51.6; in the Town of New Gloucester at mile 67; in the Town of West Gardiner at mile 100.2; and at the Interstate 295 interchange in the City of Gardiner at mile 103. L.D. 779, “An Act To Require a Public Notification and Hearing Process before Any Toll Increase by the Maine Turnpike Authority and Establish a Formal Grievance Process”: requires that the Maine Turnpike Authority provide notice and hold public hearings in at least three municipalities no later than 60 days before voting on and instituting a toll increase and establishes a grievance process to receive complaints from the public. L.D. 917, “An Act To Waive Tolls on the Maine Turnpike for Certain Disabled Maine Veterans”: requires the Maine Turnpike Authority to waive tolls on the Maine Turnpike for certain disabled Maine veterans. L.D. 957, “An Act To Require Legislative Approval for the Issuance of Bonds by the Maine Turnpike Authority”: requires that the Maine Turnpike Authority receive legislative approval prior to its issuance of bonds. L.D. 713, “An Act To Return Local Revenue Sharing to Full Funding”: emergency bill, establishes a plan to return the state-municipal revenue-sharing program to full funding over a 3-year period and replace the arbitrary fixed-dollar reductions used to reduce funding for local governments and balance the General Fund budget. L.D. 940, “An Act To Reestablish State-municipal Revenue-sharing as a Compact between the State and Municipal Governments”: restructures two funds that are the depositories of state-municipal revenue-sharing resources prior to distribution to municipalities as irrevocable trusts and renames the funds. L.D. 188, “An Act To Criminalize Possession of a Suspended or Revoked Concealed Handgun Permit”: requires the holder of a revoked concealed handgun permit to immediately surrender that license to the issuing authority and makes possessing a suspended or revoked concealed handgun permit a class E crime. L.D. 189, “An Act To Establish a Central Concealed Handgun Permit Database”: directs the Commissioner of Public Safety to establish an online concealed handgun permit database that is accessible by law enforcement, courts and bail commissioners. L.D. 191, “An Act To Authorize the Suspension of a Concealed Handgun Permit”: allows the issuing authority of a concealed handgun permit to suspend that permit if the issuing authority has reasonable cause to believe the permit holder’s permit may be subject to revocation and provides the permit holder an opportunity for a hearing on the issuing authority’s decision to suspend the permit. L.D. 222, “An Act Designating the Chief of the State Police as the Only Issuing Authority of a Permit To Carry a Concealed Handgun”: makes the chief of the State Police in the Department of Public Safety the sole issuing authority in the State for concealed weapons permits. L.D. 223, “An Act To Amend the Laws Regarding a Concealed Handgun Permit”: changes the minimum age to obtain a permit to carry a concealed handgun to 21 years of age. L.D. 1022, “An Act To Improve Training Requirements for Obtaining a Concealed Handgun Permit”: requires an applicant for a permit to carry a concealed handgun demonstrate possession of defensive handgun skills and a knowledge of the applicable provisions of the criminal laws of the state. L.D. 316, “An Act To Provide Property Tax Relief for Noncombat Veterans”: provides a $4,500 property tax exemption to noncombat veterans and their relatives if they would qualify if the veteran was living. L.D. 719, “An Act To Ensure Access to Information in the Property Tax Abatement and Appeals Process”: allows a person who is legally blind and who lives in cooperative housing to qualify for property tax exemption from the first $4,000. L.D. 1164, “An Act To Allow Cooperative Housing Owners Who Are Blind To Qualify for the Property Tax Exemption”: allows a person who is legally blind and who lives in cooperative housing to qualify for a property tax exemption from the first $4,00. L.D. 1207, “An Act To Expand the Property Tax Exemption for Veterans Who Are 100% Disabled”: provides a complete exemption from property taxes for the estate of a veteran who is receiving any form of pension or compensation from the United States Government for total, service-connected disability. L.D. 1218, “An Act To Amend the Law Regarding Affordable Housing Tax Increment Financing”: includes the costs of case management and support services in the authorized project costs allowable for financing under an affordable housing tax increment financing program. L.D. 574, “An Act To Amend the Laws Governing Reapportionment To Conform to the Constitution of Maine”: conforms the statutory provisions of Maine law regarding reapportionment of congressional districts and county commissioner districts to reflect the reapportionment procedures specified in the Constitution of Maine. L.D. 767, “ An Act To Limit Contributions to Candidates for Maine Offices to Maine Residents”: limits contributions to candidates seeking to be elected as governor, as a member of the Legislature or for a municipal office to contributions from state residents. L.D. 921, “Resolve, Directing the Commission on Governmental Ethics and Election Practices To Improve Public Access to Campaign Finance Information”: requires the Commission on Governmental Ethics and Election Practices to make readily available a list of all publicly available campaign finance information for a candidate on the commission’s publicly accessible website. L.D. 1077, “An Act To Amend the Maine Clean Election Act and Campaign Finance Laws”: removes the contribution limits placed on contributions directly to the campaign of a candidate for the Legislature, governor or other state or local offices; eliminates the requirement that participants must collect $5 qualifying contributions; removes the prohibition from accepting contributions from outside sources; and provides that there are not distinctions made between enrolled and unenrolled candidates under the Maine Clean Election Act. L.D. 481, “An Act To Amend the Laws Governing Virtual Public Charter Schools”: requires the authorizer of a virtual public charter school to review and approve the courses and curricula; requires that education personnel operating a virtual public charter school hold valid teacher certification in the state; requires that each virtual public charter school student receive at least two personal visits from a teacher during each school year; and provides that only 20 percent of the per-pupil allocation of state and local operating funds follows the student to a virtual public charter school. L.D. 671, “An Act To Protect Charter Schools by Requiring Them To Be Operated as Nonprofit Organizations”: requires that public charter schools and virtual public charter schools established in this state be operated as nonprofit organizations. L.D. 729, “An Act To Allow Charter Schools To Request Waivers from Certain Requirements”: allows, upon approval by the public charter school’s authorizer, a public charter school to request from the commissioner of Education a waiver of a civil rights or a health and safety requirement. L.D. 995, “An Act To Establish a Moratorium on the Approval and Operation of Virtual Public Charter Schools”: emergency bill, provides that the Maine Charter School Commission may not authorize the operation of any virtual public charter school until the Legislature enacts legislation that expressly authorizes the operation of virtual public charter schools in the state; specifies that virtual public charter schools provide education services through an online learning program that enrolls students on a part-time basis in grades 9 to 12; the Maine Charter School Commission is directed to report its findings by Dec. 1. L.D. 1128, “An Act To Provide for Greater Public Input and Local Control in the Chartering of Public Schools”: requires that any person, group or organization, prior to filing an application for a public charter school with the Maine Charter School Commission, must hold at least 3 public hearings in the region that would be affected by the operation of the public charter school; outlines the requirements for the meetings; provides that the Maine Charter School Commission may accept an application for a public charter school only if the organizers of the proposed public charter school meet each of the requirements and if the majority of the persons that attended the public hearings held by the organizers voted in favor of the proposed plan to operate a public charter school in the region; and requires the commissioner of Education to review the current funding laws and rules for public charter schools and to submit proposed legislation that provides options for funding public charter schools. L.D. 1130, “An Act To Create a Virtual School Managed by the State”: proposes to establish a state-managed virtual school which would allow the state to maintain direct oversight over and apply stringent quality controls to the management of the school; use current in-state talent and, to the extent possible, rely on content prepared and shared by teachers within the state; be designed to best deliver services to students and schools in the most cost-efficient manner; and focus on maximizing the delivery of course content and material to rural schools.